I have an idea to increase the surface area of the top bar / comb interface: staple wire mesh to the underside of the top bar. My hope is that it can strengthen the connection between the wax and the wood, so that it can tolerate shock and heat better. I made a prototype, and I'll post a photo in the next message. The angle is 20 degrees, the mesh is 3mm stainless steel, attached with steel staples. I must say I cannot see the logic here - how does the mesh improve the bond? Surely a slightly rough wood surface is more than adequate? Wouldn't it be better just to avoid the 'shock and heat' in the first place? I see the staples and mesh as something that need not be there. Humidity, rusty staples, possible small metal pieces in the comb? As Phil suggests, roughing up the underside surface of the bar to make a key is probably sufficient. Never had a problem with lack of adherence between combs and wood myself. If you are thinking along the lines of possible comb collapse in hot climates, not sure the collapses routinely occurs at that point but the sunshine state boys would know best. For peace of mind I have always roughed up my starter strips but to be honest, I think it’s more for my benefit than the bees. Perhaps a rough wood surface is more than adequate. Perhaps not. This is an idea to increase the surface area over what can be done with roughed wood. I'm an engineer. My policy is, if it ain't broke, take it apart and fix it. Sure. I've never had comb fall, knock on wood. But I know many TBH beekeepers who have had comb fall, and the explanation is usually shock and heat. This might be a way to ameliorate that problem. But I know many TBH beekeepers who have had comb fall, and the explanation is usually shock and heat. Usually it is from miss handling of combs. As already mentioned it isn't the connection between wood and wax that fails but down from this connection. The main problem is when handling combs that are full of nectar, honey or even brood in a way that fractures or weakens the mid rib. Being heavy and no way for the bees to reach and fix the problem a collapse can happen. They just don't understand if they emptied the comb they could reach the damaged area to fix it like they can with empty combs before they fill them. I think the bees would tend to want to stay away from this bar, and might build elsewhere, possibly away from hive elsewhere. I wouldn't risk it. Just take a hand saw, put it in a vice, Run your top bars over the blade in all directions... That's what I do and didn't have any collapses. The issue most of the time is from fresh comb from what I found. newly drawn comb with no brood ever being in them are the weakest. I suggest not moving the newly drawn comb until it has had a round or two of brood in it, or unless you're going to harvest. Just take a hand saw, put it in a vice, Run your top bars over the blade in all directions... That's what I do and didn't have any collapses. So it sounds like you are roughing your bars in order to increase adhesion. Do you have experience with un-roughed bars not having enough adhesion? The issue most of the time is from fresh comb from what I found. newly drawn comb with no brood ever being in them are the weakest. I suggest not moving the newly drawn comb until it has had a round or two of brood in it, or unless you're going to harvest. By "issue" do you mean comb separating from the top bar? Where was the separation point? Do you have any theories why brood comb might be less prone to separate? No, they plaster on the propolis, even with the hive tool it is hard to remove. I have had nothing collapse from the top bar it's self (My bars were smooth but I use ruff cut cedar now and it's pretty abrasive), only the mid point because like Garret said it all starts from fractures, most likely caused from handling the top bar before it was able to gather enough propolis and cocoons. Even handling comb in the correct way can cause some issues also, Gravity is our enemy with fresh comb if I do have to look for eggs or larva in new comb I move it very slowly but even with 1 round of brood through the comb it gets really strong. Not something I'd consider, especially having seen the way some traditionally hived bee's avoid the wire in the foundation sheet, strange to see a neat 'w' thru brood. Try a new policy; "think sustainable" if it aint broke leave it be, if its broken use reused materials. Iron mesh is far from sustainable. I second biobee. Rough surface is better but not necessary. 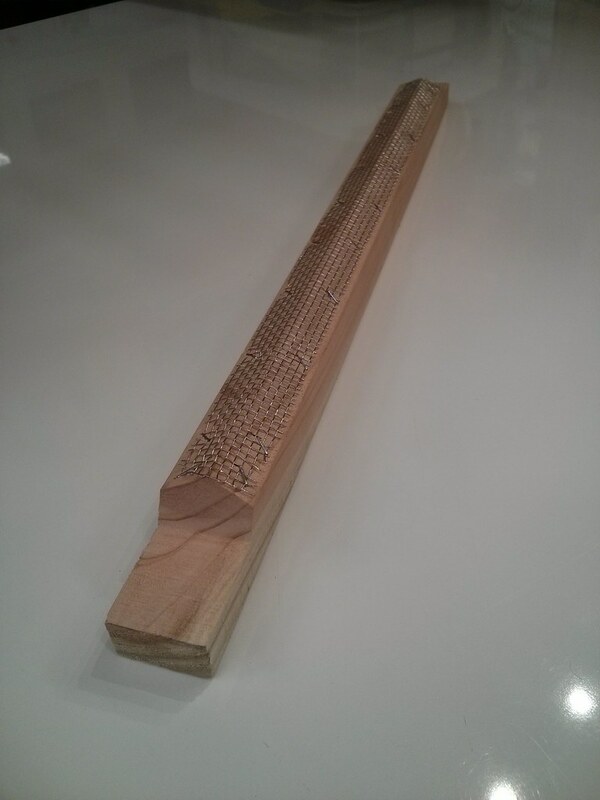 I have bees build comb on very fine wood surface and it never was an issue. If the comb collapse it does so a few centimeters away from the top bar leaving behind at least 3-4 cm comb still well attached to the bar. If the comb detach entirely from the top bar it might be from the heat/sun. Improve ventilation under the roof. Beeks using popsicle sticks have lots comb detachment because the stick is sticking down too much creating weak connection. Stop using sticks and no issues. Young wax comb is very fragile. Take care when handling. Old comb has lots of propolis in so much more stable. Brood comb has lots of propolis mixed in and all the coocons left behind the pupation stage make it even stronger. Still care must be taken when handling since top of the brood comb is honey storage which has less propolis and no coocons, it still can break if handled without care. Comb collaps after 2,5 hours bumpy drive. As you can see the comb did not detach from the top bar. It broke a few centimeters under the bar. All bars have fine surface. Dusko, I'm really sad to see your hives suffered comb collapse in transit. Was it limited to just the 3 bars in the photo or every bar. Hopefully not the latter. It would have been great for them to survive the journey unscathed, but a big ask. How are the bees coping? Did you manage to reattach the comb? I hope they all recover quickly. Sad to see the damage done and so many bees squashed. They will recover though. But there is a silver lining to be seen with the pictures you took and posted. It shows very well that even with smooth top bars the combs do not seperate from the bar iteself, rather several inches down is where they break off when handeled or moved. Does make one wonder how much damage hives incur that are continuously moved from one pollination farm to another. Sorry to hear of your travel experience Dusko. It must have been rougher driving conditions than you expected. I hope it doesn't deter you from transporting colonies in the future. Not knowing all the details a few things to consider when transporting strong colonies is the need of a large amount of ventilation to reduce any chance of over heating. From what I can see they only had a small entrance hole for fresh air exchange. Once over heated, combs will loose their structural strength and collapse. I do understand the lack of room in your trailer to carry all the hives and why you put them in smaller containers. The issue I see with the two strong colonies was in crowding them down into smaller containers and very little ventilation. A bigger volume will allow the bees to spread out to relieve any heating up discomfort and extra ventilation lets the extra heat escape the hive. You mentioned that the combs where heavy with nectar which may or may not have been part of the issue. It's hard to say but what is important to take note of is that the smaller colonies traveled fine. Analyzing the differences between the two out comes will serve you well in the future. The way I see it is to transport hives before any heavy nectar flow. Since this winter was very mild and everything begun blooming much too early (for scandinavian climate) I should have moved them in March. All hives have a top entrance and I moved them in the night time. I cant suspect heat being the issue. The two hives with big colonies were bery heavy when we carried them in comparisson to the smaller ones. Honey comb when full is very fragile and those two comonies even begun backfilling the brood combs. Im anyway against moving hives if not absolutely necessery. So in future I will only move newly made splitsor cought swarms. Actually all the transport nucleus hives are newly made and my carpenter skills are far from perfect The planks are not glued together and there are cracks in the floor and where the floor and walls meet. Plenty of ventilation. Nothing in these hives was propolised. Only one hive was a nuc from last year which propolized all cracks but that colony made it without damage. Only one 30mm top entrance hole. All 6 hives are flying. Even the one with most losses which has a handfull of bees, one brood comb and one honey comb. The 3 hives with no damage are flying very strong. The less damaged colony is flying ok so to say. Not sure if their queen survived. It would be a miracle if she made it through this! The 4th colony which had no damage is the one that survived the winter quenless (or they have an unmated virgin queen) they are not flying strong but they have lots of stores and have got brood from the most damaged colony which doesnt have enough bees anymore to keep them warm. I hope they will be able to save the brood. All in all Im 100% sure I have 1 colony with a Queen In about 10 days I will make an inspection on all hives and will know exactly whats going on. 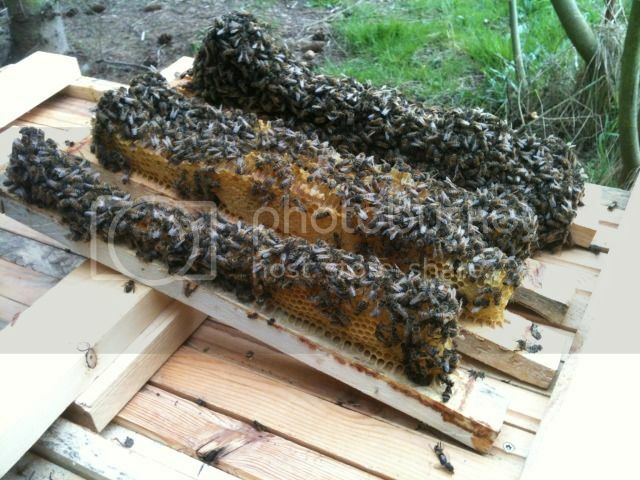 Until then may theyrecover and get used to their new Apiary. No I didnt try to re-attach the combs. I used Les Crowder's method of placing the broken combs against the back wall close to the undamaged combs which are still hanging. I placed a tiny stick in between the broken comb to create a bee space so the bees can care for the brood. Lets see how this works.